The recent frontpage of the New York times. War on Syria: Is a photo able to prevent the US-led attack? Something remarkable has happened. 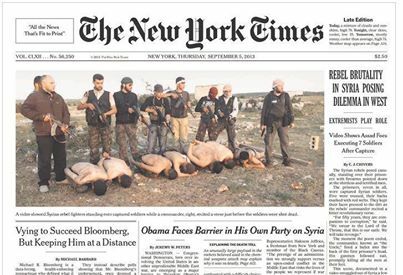 The New York Times, the most influential newspaper in the United States, has published a photo on its front page on Thursday that may be able to prevent the attack on Syria. The photo shows how seven soldiers of the Syrian Army, who were caught by the terrorists, are kneeling on the ground and have their hands tied to the back while they are waiting for their execution. All soldiers have terrible wounds on their backs and arms. Behind them on the photo are exactly the guys, which the United States supports and supplies with weapons. After the leader Abdul Samad Issa read out a poem, all prisoners are killed by headshots. The dead bodies were then thrown into a hole. The New York Times (NYT) shows the video of this massacre online on its website.